2010 runner-up Mariame Fadiga (West Windsor-Plainsboro South) leads seven ladies seeded over 100 feet. Chanel Johnson’s meet record of 130’ 3” looks to be safe, however, last year’s sixth place throw of 92 feet currently sits 12th on the performance list going into the meet. Rancocas Valley brings good blood in Lauren Mirabelli! In one of the deepest events in the field, it may take a meet record to medal in this event! Connor Thompson of Father Judge (PA) won the inaugural meet establishing the record at 157’ 5”. Eight boys bring in seeds of over 150 feet – with four over 160 – led by Christian Spaulding of Middletown South. Defending champion Mariame Fadiga of West Windsor-Plainsboro South once again leads the way with a personal best of over 40 feet!! Robbinsville’s girls circle extends just over 40 feet. Stop by and look for Mariame to hit the wall! A tight field of eight girls between 36 and 37 feet and change should make for a great battle for some hardware! Corey Abernathy’s (West Windsor-Plainsboro North) meet record of 56’ 5” looks to be in danger. Sam Snyder of Hopewell Valley leads the field with a personal best of 58’ 10”. Three boys bring in personal bests of 55 feet or better. The top seeded flight starts at 46 feet! In 2011 eleven ladies come in with a personal best that would have made the medal stand last year. Ten 100+ throwers will make for some great competition to attend that same awards ceremony this year. Those ladies are led by Amber Brown of South Brunswick who brings a personal best of 122’ 9”. Come out to Robbinsville High on Saturday May 7th to see some great competition as our guys and girls THROW STUFF!!! A very deep event for guys. SEVENTEEN jumpers in the field have PRs over 40 feet. They are led by John Landis of Father Judge (PA) at 44 feet even, Chris Ramsey of Byram Hills (43-7.5), Robert Wiggs of Nottingham (43-1), and Tornado teammates Justin Bailey (43-3) and Hakiem Horton 41-5 of Trenton Central. We do indeed have high jumpers coming out of our ears as THIRTEEN 6-foot high jumpers will meet up here with 6-4 looking like the hop necessary for a medal. Freehold Township’s Jonathan Galya (6-8) and Dave Benjamin (6-6) will duel with Justin Bailey (6-9) Hakiem Horton (6-8) of Trenton High for team bragging rights. House of Pain sponsors the field event of the meet as once again the magic number is 17. SEVENTEEN young men bring personal bests of over 20 feet to the Ravens’ runways. The top end of this event is loaded with studs as the top 8 jumpers own personal best leaps over 21 feet, including five guys at 22 feet or better and two other an inch or less away. Robert Wiggs of Nottingham (22 feet) joins the battle for the unofficial “team title” as the top four jumpers consist of two pairs of teammates. John Landis (22-5) and Matt Smalley (22-0) of Father Judge (PA) will meet top seeded Charles Kerr (22-8.75) and Lamar Hayes (22-1) of the Lawrenceville School. The jumps get started off with some great competition amongst the lady high jumpers. Alexia Williams (Dayton HS) and Noel Jancewitz of host Robbinsville HS are the class of the field with personal bests of 5-10 and 5-9.25 respectively. Look for Noel, she’s the one with gold watch. Noel finished second at the Penn Relays and earned the honor of TOP AMERICAN in the competition. This is yet another very deep even with 13 other ladies bringing personal bests of 5 feet or better. This event appears to be wide open, with the top four seeded ladies within three inches of one another. Teammates Ashleigh Delamos and Maya Inozemtseva (West Windsor-Plainsboro South), Adrienne Williams (Notre Dame), and Anne Lee (Allentown) fall between 35 feet even and 35-3. A very deep event for guys. SEVENTEEN jumpers in the field have PRs over 40 feet. They are led by John Landis of Father Judge (PA) at 44 feet even, Chris Ramsey of Byram Hills (43-7.5) Robert Wiggs of Nottingham (43-1), and Tornado teammates Justin Bailey (43-3) and Hakiem Horton 41-5 of Trenton Central. Sydnee Pierce (Rancocas Valley) leads the field with her personal best leap of 18-5.75 and is the top seed by over a foot. Ciara Alston (Carteret), Lizzie Edokwe (Lawrenceville Prep) and Maya Inozemtseva (West Windsor-Plainsboro South) will challenge as they both bring in personal best over 17 feet. Here other ladies have personal bests over 16 feet and could push each other tosome new personal bests while in the medal hunt. House of Pain sponsors the field event of the meet as this time the magic number is 18. EIGHTEEN young men bring personal bests of over 20 feet to the Ravens’ runways. The top end of this event is loaded with studs as the top 8 jumpers own personal best leaps over 21 feet, including five guys at 22 feet or better and two other an inch or less away. Robert Wiggs of Nottingham (22 feet) joins the battle for the unofficial “team title” as the top four jumpers consist of two pairs of teammates. John Landis (22-5) and Matt Smalley (22-0) of Father Judge (PA) will meet top seeded Charles Kerr (22-8.75) and Lamar Hayes (22-1) of the Lawrenceville School. A very deep event for guys. SEVENTEEN jumpers in the field have PRs over 40 feet. They are led by John Landis of Father Judge (PA) at 44 feet even, Chris Ramsey of Byram Hills (43-7.5) Robert Wiggs of Nottingham (43-1), and Tornado teammates Justin Bailey (43-3) and Hakiem Horton (41-5) of Trenton Central. Sydnee Pierce (Rancocas Valley) leads the field with her personal best leap of 18-5.75 and is the top seed by over a foot. Ciara Alston (Carteret), Lizzie Edokwe (Lawrenceville Prep) and Maya Inozemtseva (West Windsor-Plainsboro South) will challenge as they all bring in personal best over 17 feet. Three other ladies have personal bests over 16 feet and could push each other tosome new personal bests while in the medal hunt. Coach Mike Walker, Robbinsville High School. The action on the track gets started with a quality and depth. The top two heats will see ladies with personal bests of 68 seconds or better. In the seeded heat, defending champion Marilyn Allen (WW-P North) and teammate Christina LiPuma enter with personal bests under 66 seconds. North Brunswick teammates Breanna Nicholson (65.54) and Casandra Destefano (66.0) and The Hun School’s Julia Curley (65.7) round out the top competitors. The short sticks are led by Ashleigh Delamos (WW-P South). Delamos’ teammate Paige Brown, Kaitlyn Davis (North Brunswick), Whitney Jackson (Columbia) and Adrienne Williams (Notre Dame) are top contenders for the final with personal bests under 16 seconds. Eight heats of 6 ladies will compete for a spot in the final later under the lights. Jermaine Collier (Trenton Central) ran 53.11 to take the Penn Relays Championship in this event last weekend. He is the top seed here by over three seconds. Mike Cross (Hopewell Valley) owns the next best PR at 56.55. The rest of the medals are up for grabs with many runners in the 57-58 second range. A change to this year’s twilight meet is a high hurdle final UNDER THE LIGHTS. 42 boys are entered in the prelims with the top eight going to the finals. The 8th seed is at 15.64. The race up front has the potential to be blazing fast, led by Jermaine Collier (Trenton Central) who enters with a sub 14 second seed. Fellow Tornado Mu Mu (14.4) and Greg Caldwell (14.4) from West Windsor-Plainsboro North add impressive personal bests to the field. While I cannot out verbiage the always spellbinding Blackbeard, a picture does equal 1000 words, give or take. 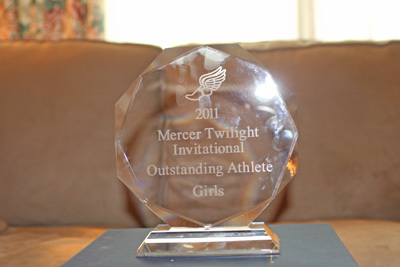 A sample of the Outstanding Athlete Awards for the Mercer Twilight. To be presented by that famous Cleaner of Clocks. Girls: HUGE field with some outstanding sprinters at the top end. Miranda Mackey (Hopewell Valley) is one of 22 girls seeded under 28.0. She is a big favorite with a quick 24.89 seed. Boys: This event has the makings of GREATNESS. A remarkable THIRTEEN runners are seeded under 23.0. The medal race will be a hot one as the cut-off for the fast heat stands at 22.3!!! Keep an eye on the race between the top three seeds who all own personal bests of under 22.0 as Trenton’s Jermaine Collier (21.9) takes on Snyder HS teammates Rashawn Taylor (21.7) and Zamir Thomas who owns an incredible 21.19 personal best!! WOW!!! I think that dude worked on the Chatsworth blueberry farm that I worked at during the summer of '94. He hated “skeeters” and would eat “critters” for lunch.